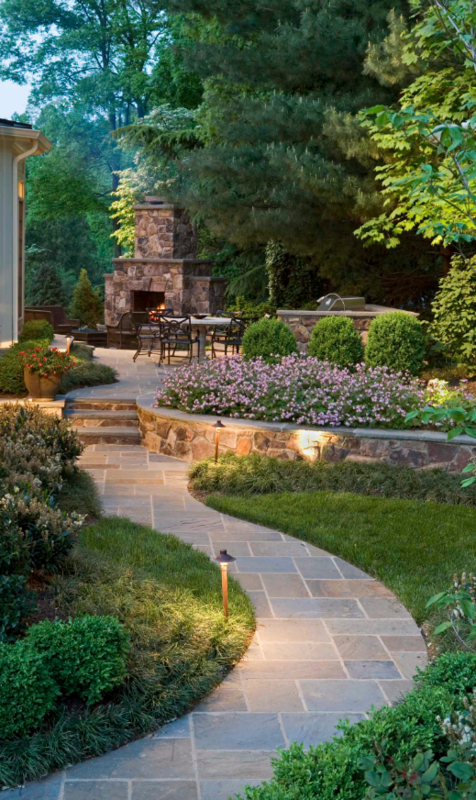 Make your home stand out with gorgeous landscaping. Here are some DIY landscaping ideas you can do yourself! The weather is getting warmer, so you may find yourself thinking about being outside more often. Long walks in the evening, hikes on the weekend and swimming in your free time all sound like amazing ideas, but if you’re a homeowner, your thoughts might be leaning more toward projects. When you own a home, there always seems to be something to fix or upgrade, and being able to get outside means that you can transform the outside of your house. Landscaping projects can literally transform your home over the weekend and can seem like one of two things — you can either tackle them and get them done quickly or feel like you need to hire an expensive professional. This summer, don’t worry about spending the extra money to get someone else to do the work for you. Plenty of landscaping projects can be done by anyone! Read on for some DIY landscaping ideas that you might be interested in so you can get one step closer to the yard of your dreams. Those with gravel driveways and sidewalks know that they looked great when you went to tour your home, but over time, the gravel gets everywhere. It’s difficult to rake back into place, leading many homeowners to let the gravel drain wherever it wants to after a rainstorm. It’ll just get messy again after the next spring shower, so why even try? That’s where edging comes in. Edging is a simple and affordable way to keep gravel in place through storm after storm. If you buy your edging at a local hardware store, get out your old shovel and start digging, you can have plastic edging installed in no time. This project is a major time saver and worth every penny. Have a garden that you know you’ll be spending time in over the summer? Picture it surrounded by a classic stone wall. The grey slate will bring out the colors of your garden and help keep the soil cool to prevent rapid evaporation of the water near the roots. You can build one with just a few steps, so it’ll be ready by the time you’re about to lay down new seeds. Sometimes it can feel like every house on every home improvement show has that classic look of an outdoor grill set in stone. You can have that too, without needing to move or let a professional build one for you! You can install one using any design you like as long as you get the technique down. You’ll have your grill ready to go before the Fourth of July parties roll around. Don’t forget to clean off the surrounding area and equipment with an air compressor for the best results. Here are a few safety tips when working with air compressors. An old walkway might be the eyesore of your yard, causing you to be outside less than you’d like to be. Upgrade it this summer with tile! Tile is easy to sweep and keep clean, and you can learn about easily laying tile so you can even lay it out around your pool. Grass from wet feet will no longer clog those pool drains! When you have an issue with drainage in your yard, it’s an unavoidable mess. It can ruin the grass you’ve worked so hard to grow, and it can carve crevasses into your gravel driveway. Fix your drainage problem in a breeze with a French drain. After digging a trench and laying the pipe, you’ll create a way for rainwater to drain without messing up your gorgeous landscaping. Landscaping projects are always about making your yard look better, which is why there’s so much pressure when you’re trying to decide if you can do them on your own or not. You don’t want to ruin how your landscaping looks while trying to improve it! Thankfully, there are some easy projects you can do like laying a tile walkway or inserting a French drain so that you only have to spend a day or two working and can enjoy your yard for the rest of the summer. next post	Grow a Healthy Lawn this Spring Once and For All – Here’s How!